UK Stampin' Up! 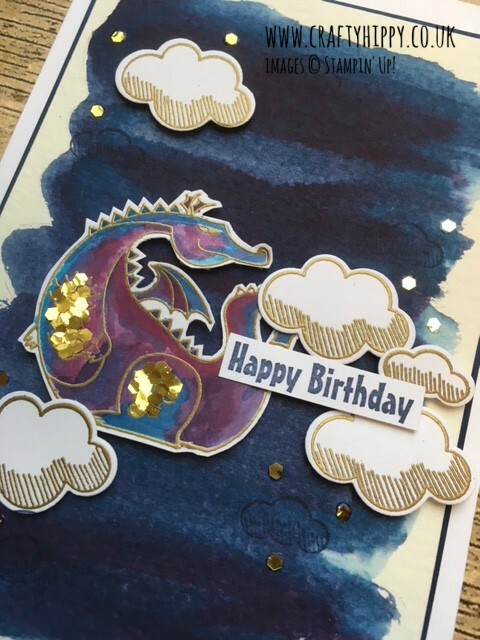 Demonstrator | make beautiful cards | Crafty Hippy: How to make a dragon card - Use the Magical Day stamp set from Stampin' Up! 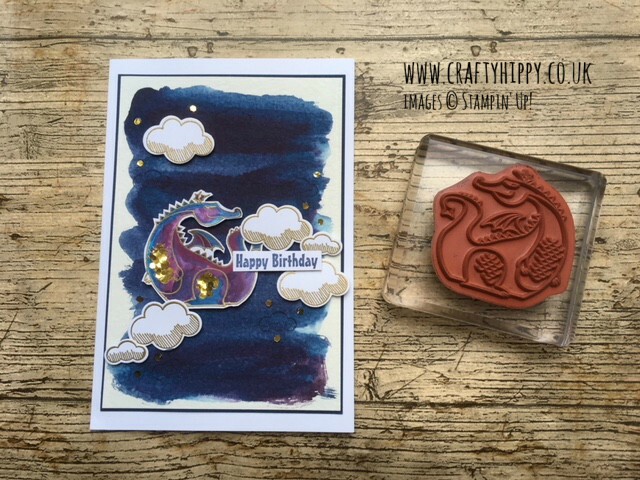 How to make a dragon card - Use the Magical Day stamp set from Stampin' Up! The Magical Day stamp set from Stampin' Up! Just when you think you couldn't have any more fun! 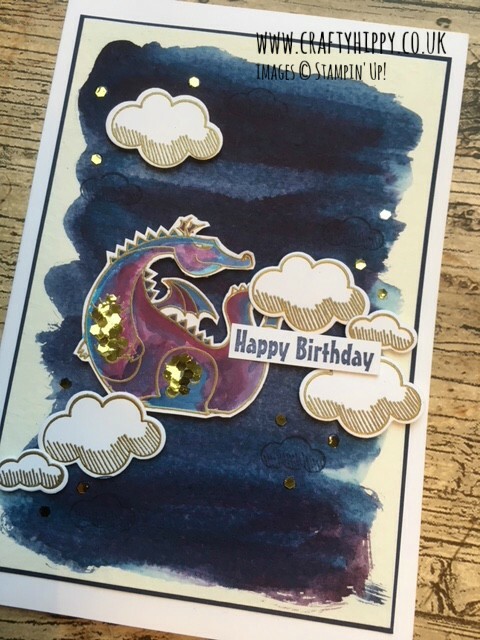 I'm really enjoying the Magical Day Stamp Set dragon this week. SO much fun. First we had a Fiery Red Dragon, and then we had a Rose Red Dragon, much like Puff the Magic Dragon. Today we have a Pacific Point and Rich Razzleberry Dragon. Thanks goes to Lauren Alarid of Crafty Little Peach, a Stampin' Up! Demonstrator in the USA who gave me inspiration with her sparkly dragon (thanks Lauren). 1. Select the Prussian Blue and Brilliant Red Brusho Crystal Colours. Mix with some water and watercolour some of our Watercolor Paper using an Aqua Painter. Set aside to dry. 2. Stamp the dragon in Versamark. Heat emboss with Gold Stampin' Emboss Powder. Fussy cut out with Paper Snips. 3. Using an Aqua Painter and colours of your choice (I used Pacific Point, Night of Navy, Rich Razzleberry and Elegant Eggplant) colour your dragon. Set aside to dry. 4. Emboss gold clouds using the Lift Me Up stamp set. Cut out using the scissors, or the Up & Away Thinlits Dies and the Big Shot. Use the small cloud stamp and some Night of Navy to stamp some clouds on your background. 5. Assemble your card using Snail and Dimensionals. Adhere some Gold Glitter Flakes to your dragon and the background of the card. I really hope you liked this project.